Lo Pan Temple (Chinese: 魯班先師廟; Jyutping: lou5 baan1 sin1 si1 miu6) is a temple located in Kennedy Town, Hong Kong Island, Hong Kong dedicated to Lo Pan (魯班; also transliterated as "Lu Ban"), the patron saint of Chinese builders and contractors. First built in 1884, it is now classified as a Grade I historic building, and is also part of the Central and Western Heritage Trail-The Western District and the Peak Route. Located at 15 Ching Lin Terrace, the temple is the only urban temple in Hong Kong erected to commemorate Lo Pan. It was built by the Contractors Guild in 1884 with donations from many people connected with the trade. According to the record of a stone curving inside the temple, over 1172 people from different towns in Guangdong joined together to donate money for the establishment of Lo Pan Temple. The ownership of the land on which the temple was built has changed several times over the years, and in 1921 it was acquired by the Kwong Yuet Tong, which is currently the management body of the temple. In 1949, Kwong Yuet Tong was registered as a legal entity to manage the Temple. The staff of Kwong Yuet Tong mainly consists of the builders in Hong Kong. Although there are a few temples on the mainland dedicated to Lo Pan, they are usually associated with other gods; Lo Pan Temple in Hong Kong pays tribute solely to Lo Pan. Although repair and maintenance work is often carried out, the Temple generally remains as its original appearance and structure. In 1949, an office of Kwong Yuet Tong and Hong Wah Secondary School were built on the vacant land next to the Temple. The Temple is a two-hall structure, with an unusual jagged roof, elaborate "fire" type parapet walls, clay sculptural figures, relieves and paintings inside and outside the Temple. It is the Chinese temple with the largest number of wall-paintings on Hong Kong Island. Lo Pan Temple is known for its diverse murals filled with traditional Chinese Cultural style depicting different people, insects, animals, flowers and landscapes such as butterflies and narcissi (蝴蝶水仙圖), rowing a boat (張騫泛槎圖), Chibi night map (夜遊赤壁圖), visiting friends (訪友圖), ladies next to the rock (倚石仕女圖), etc. Different styles of calligraphy are incorporated into the wall-paintings to serve as captions. Having different clay sculpture on the walls is one of the unique characteristics of Lo Pan Temple since it is difficult to find clay sculptures in the temples on Hong Kong Island. Those sculptures can be found on the wall and gable of the Temple. The theme of the sculptures are mainly about some Chinese history and mythology. For example, inside the Temple, there is a clay sculpture of one famous Chinese mythology "Historical Romance"(封神演義) on the left wall. There are also clay sculptures of plants, animals, etc. around the Temple. Inside the temple, there is a stone curving which is the oldest antique established in the Qing Dynasty. It records the purpose of building this temple – to commemorate Lo Pan as the god of Chinese Architecture and to remind descendants to think of the origin. On the two sides of the main door, there are engravings of Chinese poems which praise the contribution of Lo Pan in Architecture and wish his spirit can last forever. On the 13th day of the sixth month of every Lunar Calendar, the birthday of Lo Pan, Kwong Yuet Tong celebrates Lo Pan Festival. Meals (師傅飯) are distributed to celebrate the Festival. Many builders participate in the pilgrimage up the 200 steps from Belcher's Street to pray for working safely and smoothly. Builders and the Government also donate money for the upkeep of the Temple. Besides, Lion dance and dragon dance are performed outside the Temple for entertainment and a ceremony is held by the Labour and Welfare Bureau to award the builders with outstanding performance to encourage the improvement of skills within the construction industry. Apart from the celebration, Taoist priests are invited to comfort the deceased by chanting prayers inside the Temple. 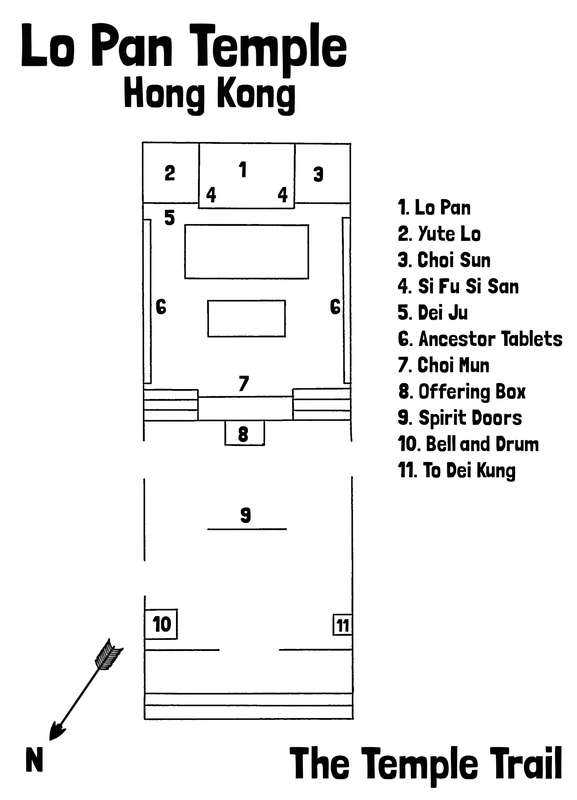 ^ "Heritage Trails : Lo Pan Temple, 15 Ching Lin Terrace". Amo.gov.hk. Retrieved 15 November 2018. ^ Chan, Quinton & Asprey, Donald. "School and temple may get heritage status; Historic King's College and the Lo Pan shrine could be declared monuments". South China Morning Post dated 9 January 2006. ^ Guide to Architecture in Hong Kong. Hong Kong: Pace Pub. Ltd., 1998. ^ Tang Hoi Chiu [et al.]. Chinese temples on Hong Kong Island. Centre of Asian Studies, 1983. ^ "Lu Banxian's birthday". Hkhikers.com. Retrieved 15 November 2018. Wikimedia Commons has media related to Lo Pan Temple. This page was last edited on 7 April 2019, at 03:28 (UTC).